Two battalions of the Brunswick Regiment Mansberg (formerly von Behr). 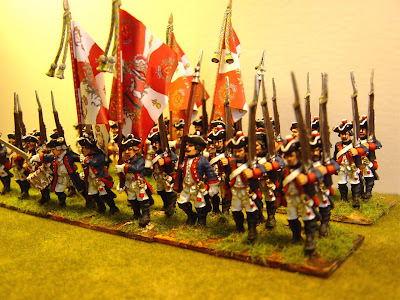 This regiment has its post 1760 new flags and I have used these as they are rather more colourful than their previous ones. The figures are all the fantastic Copplestone Foundry range (before Rob Baker got his hands on the range) and it was partially the beauty and crispness of the figures (plus ease of painting) that got me into 25mm SYW. My previous SYW armies had all been 15mm and those armies now live in New York with my friend Jon. 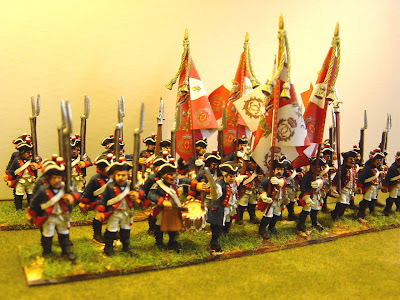 My current project is SYW British cavalry and I'll post pictures of the completed brigade by next weekend. ..ah - now those castings are much better - they really do look very imperious... nice paint job helps, of course! I particularly like the way you handle eyes. Not a great fan of fully painted eyes, ie. with whites and eyeball, but you manage to do it to give the impression of the eye without going the whole hog.. Thanks Steve. I always start with faces and enjoy doing eyes - two dashes of white with black pupils. The placing of the latter gives the faces character - you can achieve various looks like surprise, shock, boredom etc by the placing of the pupils. I don't take time over this and each figure turns out slightly differently.